In November last year, AITC Inc. was an exhibitor at I/ITSEC 2018—the world’s largest modeling, simulation and training event hosted by the United States Army Program Executive Office Simulation, Training and Instrumentation (PEO STRI) —right here in Orlando, Florida. One of the technology solutions we showcased was an innovative way that virtual reality (VR) has become more mobile—whether you’re inside or outside, but not lacking any power or capabilities. VR technology has been linked with gaming for years, but what if you can take the fun of VR to empower people in the classroom or the workplace? Or, what if VR enabled you to take the classroom or workplace with you? VR in the workplace and the classroom is becoming increasingly commonplace in several industries, helping users to become more engaged with their work. And let’s face it—trainings sometimes can be a little dull—or, at the very least, hard to take what’s written down on a page to incorporate it into the real world. With traditional training methods, it can be challenging to engage new employees with pertinent information about their jobs and their companies. It can also be time-consuming to train someone on something that requires a lot of hands-on time and experience without possibly disrupting ongoing business operations. In 2017, HP introduced the Z Backpack—a more professional way to use VR. For training and simulation, this VR system can make work more alive and real in ways that traditional training programs cannot. What’s unique about this system is that it’s a sophisticated and powerful computer that you can take with you—but it’s not a laptop. The Z Backpack is a wearable PC with hot swappable batteries—all without any cumbersome cords getting in your way. With a VR headset and two wireless controllers, you can immerse yourself in whatever simulation or training you desire. When you’re inside, you can dock the system on your desk and wirelessly connect the PC to a desktop screen. If you need to move around or take it outside, you snap the PC to the backpack, put the backpack on, and you’re all set to go. 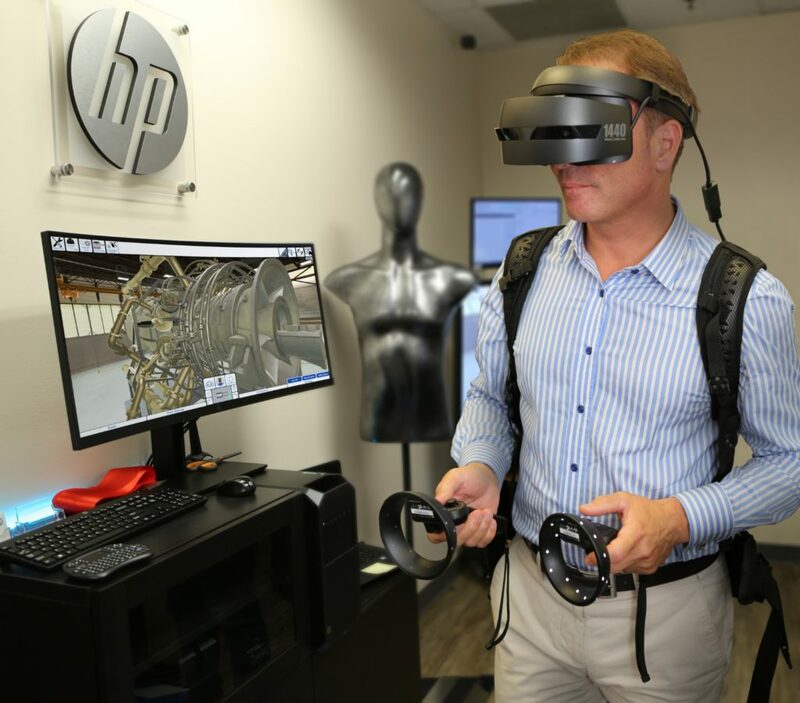 There are endless simulation and training possibilities with the HP VR Backpack, and that includes military capabilities. In April 2018, Orlando-based software and training solutions firm, DiSTI, formed a partnership with HP as DiSTI’s hardware partner to develop more enterprise-level training solutions. At I/ITSEC, AITC showcased the power and freedom of HP’s Z Backpack along with DiSTI’s training platform, VE Studio. The virtual training showcased at I/ITSEC was created for the U.S. Army Air National Guard. At I/ITSEC AITC showed how VE Studio created a training curriculum for a Virtual Maintenance Trainer (VMT) to provide over 115 maintenance procedures used to maintain the EC-145 (commercial variant)/UH-172 (military variant) helicopter systems. “The VE Studio tool/platform was used to develop the training program in its final rendered form and integrated with the HP backpack to provide an untethered training/demonstration experience at I/ITSEC. VE Studio has been developing a host of training solutions for military and civilian programs around the world – such as helicopters, lawn equipment, tanks, aircraft, and gas turbines and AITC sees this technology as expanding training capabilities and efficiencies in many areas and markets,” says David Balleweg, AITC’s Director Sales and Marketing. For the U.S. Army Air National Guard, DiSTI was able to quickly create and deliver a training program for half the cost of traditional VMT programs. They helped saved the government an estimated $4 million. In addition to saving time and money, DiSTI’s program helped to make soldiers ready to work on a helicopter without causing any disruptions that come with having to use an actual helicopter for training. DiSTI’s virtual training program also allows for multiple students to work simultaneously as a team in a VR vignette along with an instructor. “VR and the Z Backpack are an environmental/experiential extension of the learning we create – allowing students freedom of movement within a virtual world so they can interact with the equipment much as they would in real life. These training solutions can be created for enterprise-level customers with more intricate and complicated training needs or for smaller programs, it depends on the training need and the desired outcome,” says Kevin Mikalsen, DiSTI’s Director of Global Marketing. As a systems integrator, AITC can leverage programs like VE Studio to help customers with their training needs—whether a customer would want to create their own training application or to create one for customers. This is one way that AITC can create an end-to-end IT solution that best fits a customer’s needs. For more information about this technology, please contact Lydia Perez in our sales department at sales@aitcinc.com.